There is no one-size-fits-all when it comes to supplements. The fuel you need for a strength-based workout is different from a long-winded cardio session. 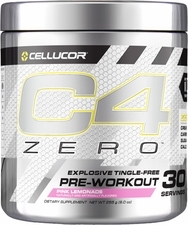 C4 is America’s No.1 selling pre-workout product for energy, focus and pumps—three components for a killer workout. We’ve taken its core foundation and created the C4 ID Series – a collection of pre-workouts personalized to serve your unique fitness goals. If you’re just starting out, don’t like the tingles that come from beta alanine or are looking for a pre-workout with quality ingredients and flavors that taste amazing, C4 Zero is YOUR pre-workout.